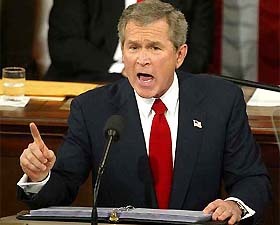 In April of 2003 the US military stood by and allowed Baghdad to be looted. Not only were private establishments emptied, but all the major ministries (except the Ministry of Petroleum) were looted and burned. When Iraqis complained to the new occupation authority, the GI’s informed them that stopping the looting was “not the mission.” The documents from the Baath Foreign Ministry that might have shed light on the dealings of Reagan, Bush senior, Schultz and Rumsfeld with Saddam Hussein before 1990 were helpfully burned. The modern history of Iraq, including cabinet meetings from the 1930s and 1940s, mostly went up in smoke (it would be as though the US National Archives for every administration since Roosevelt was burned, along with all microfilm copies). The Iraq Museum, a key repository for ancient Iraqi civilization and the history of humankind, was looted of dozens of major pieces and thousands of lesser ones. 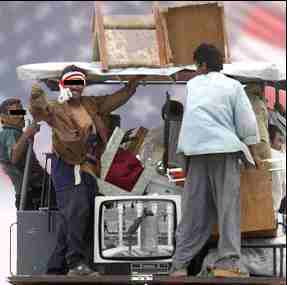 The widespread looting and the breakdown of order started Iraq on its descent into chaos. 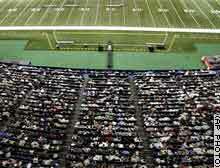 “Freedom’s untidy, and free people are free to make mistakes and commit crimes and do bad things,” Rumsfeld said . . . Looting, he added, was not uncommon for countries that experience significant social upheaval. 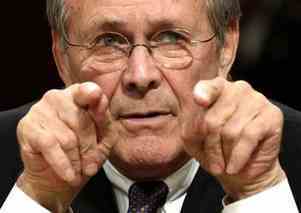 “Stuff happens,” Rumsfeld said. 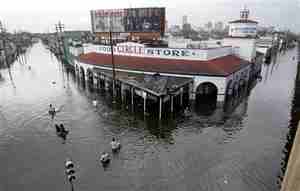 In late summer of 2005, as Hurricane Katrina recast New Orleans as a latter-day Atlantis, displacing a million persons and reducing hundreds of thousands to dire poverty, a wave of looting broke out in the city. Some legal scholars argued that where people felt their lives were in danger because of a natural disaster, they actually had the right to take food, medicine and water–and other materials necessary to their survival– from abandoned stores. So the Bush administration treated Louisiana’s Walmart managers the same way it treated Iraqi property holders, right? After all, “stuff happens,” right? Free people are free to make errors and commit crimes in times of crisis, correct? So I guess it just depends on whose property is being destroyed and looted, whether Bush bothers to send in US troops to stop looting. The Iraqis are noticing the contrast, and remarking on it. Likewise, there was a city in Iraq just a little smaller than New Orleans (population used to be about half a million), which was Fallujah (population used to be 300,000). Just as New Orleans has been emptied by a natural disaster made worse by Bush’s political decisions, Fallujah was emptied by a wholly man-made one– the Bush-ordered military assault on this civilian city, which aimed at getting at a small group of deadly guerrillas. Two-thirds of the buildings in the city were damaged, and most of its inhabitants were made refugees for months. It is likely that only about half have returned, since water and electricity service is unreliable and rebuilding has been extremely slow. Some inhabitants who returned had to live in tents atop the rubble of their former homes. Other Fallujans lived long months in refugee camps. Some children were separated from their parents, others orphaned. The children of Fallujah had taken no political side and engaged in no military action, but they were displaced (and some killed) along with everyone else. 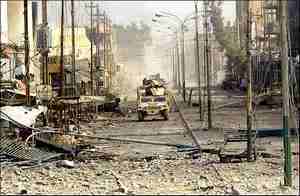 In fact, the reduction of Fallujah did nothing to stop guerrilla violence in Iraq, and rather spread it around. Mosul, a city of over a million that had been quiet, went into rebellion. Some 4,000 policemen resigned (just as many New Orleans policemen disapeared) and this once-quiet city that had been touted as a model under Gen. David Petraeus become unstable for the long term. The Sunni Arabs were so furious about the Fallujah campaign that they refused to vote in an American-sponsored election. The elected parliament therefore was dominated by fundamentalist Shiites and by Kurds, with the Sunni Arabs largely marginalized in the constitution drafting process. The brutal and ill-conceived Fallujah campaign therefore contributed significantly to the current political crisis, in which Sunni Arabs are rejecting the proposed constitution. So the moral of the story is that Bush also treated the New Orleans refugees far better than he did the Fallujah refugees (which he simply ignored). Right? Nope. At first he pretty much ignored them too. Conclusion: Bush cares deeply about the property of rich white people.